SUMMARY: A rhyming introduction to alliteration, including definition, examples, and where one might find alliteration in everyday life. 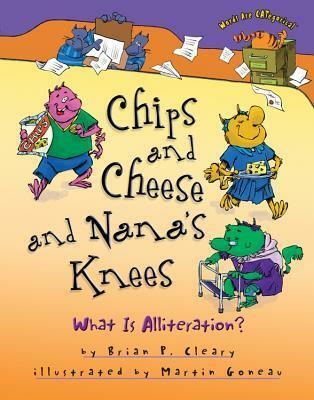 REVIEW: Chips and Cheese is yet another brilliant addition to Brian Cleary's Words Are CATegorical series, which is a must-have for any elementary, middle, or even high school classroom or library. Illustrations are bright, colorful, and entertaining. The rhyme is clever and never feels awkward or forced. Even the font helps add to the whimsical style of this fun "learning" book. I currently work in an international school in China, where many of our students are acquiring English as their second, third, or even fourth language. I've heard many times how English is the hardest language to learn because of all its influences from other countries, multiple exceptions to grammar rules, figures of speech, widely varied word order in sentences, irregularities, contradictions, and a whole host of other difficulties. Heck, even most native English speakers don't use all their grammar rules correctly or know all the various colloquial sayings, dialects, homophones, etc. How many times have you seen your and you're confused in the comments pages of Yahoo News? That said, I can't thank Brian Cleary enough for gifting the world with this series--it takes complex language concepts like parts of speech and poetry terminology and breaks them down in an entertaining way. If your school or library does not have this series, I strongly suggest you talk to your school librarian or department chair to see if they can be ordered. Beautifully illustrated and entertaining, this series is an excellent way to introduce language concepts to any student of any age. ENGLISH LANGUAGE ARTS: Read aloud with students to introduce parts of speech, figures of speech, poetry terms and concepts. Also, check out The World of Brian P. Cleary for lots of interactive language, math, and science games, as well as a Word of the Week and a Poem of the Week. An excellent resource for elementary students! MUSIC: Use to tap out rhythm or to examine rhyming words. THE BOTTOM LINE: Don't miss it--an excellent, entertaining, and easy way to introduce alliteration. STATUS IN MY LIBRARY: On order for both our libraries (elementary and middle/high). A must-have for any library. Presentation & layout: 5/5--simple layout, easy to look at, uncluttered, excellent use of space, even the font is fun! Quality of information: 5/5--Includes alliteration examples for single-letter, double-letter, and triple-letter alliteration. Also mentions alliterative sounds from different letters such as c/k or ph/f. Photos/illustrations: 5/5--All pages are bright and colorful; love the monsters as characters! Engrossing: 5/5--Very easy to read and understand. Perfect for teachers, browsers, and reluctant readers of any age. Appeal to target audience: 5/5--especially useful for grades 2-7 and ESL students. CONTENT: No worries about content for younger readers.